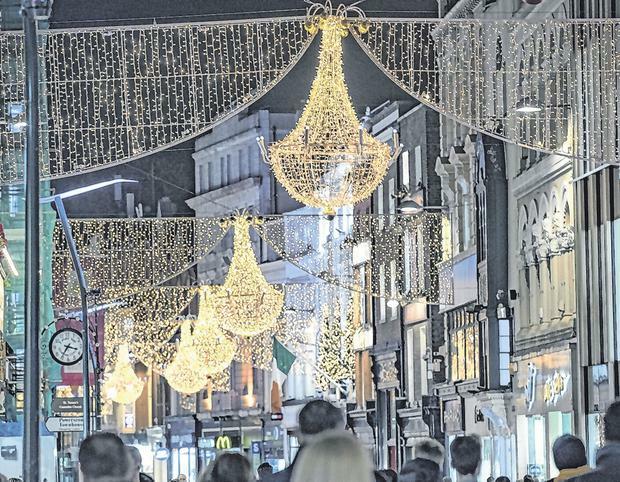 Festive scene: Christmas lights on Grafton Street, Dublin. Picture: Arthur Carron. People were incredibly warm and friendly: we’d stop with an open map and someone would pop round its edge and ask if we needed help – that’s only happened to us once previously, in the US south-west. We’d stop and ask someone for clarification of a building and, even if they cannot answer the question, we are still talking 10 minutes later – the original point long-since forgotten. If we hadn’t broken off, mindful that they had their own business to get on with, the conversation could easily have moved into coffee and pastries; then lunch, and then dinner. There is such an easy-going nature about Dubliners. Walking into a bar we were greeted like an old friend; to start with it was slightly discombobulating: the barman means someone else, surely, who had come in behind us? But that’s our southern England reserve I suppose. We loved the Georgian façades and squares and the occasional (rare) art deco building, but lamented the loss of much of the industrial port architecture. We thought that the Christmas lights were very good, what a pity that they were the only thing working on Christmas Day, but I suppose our expectation is that all European cities are cosmopolitan – certainly Amsterdam, last year, was “open”. Dublin may get there, but it may need to shake off its old Victorian and Catholic underskirts. We waited four days for the Irish Museum of Modern Art to open, then discovered its main collection was closed for rehanging – bang goes the tourist season again. There was an exhibition of Mary Swanzy pictures, but apart from some early, and very charming, pictures, the rest – after she had decided to embrace every genre emerging in Europe – descended into mere copying of the styles. She may be a good draughtsman, but she never made any contribution, merely flitted, chameleon-like, on the fringes: a reflector; an imitator. However, and there’s always one of those, step away from the main thoroughfares just a few hundred yards and Dublin has a very serious problem with dogs fouling the pavements: as an example, we walked east from the North Georgian Quarter and then south towards the quays – it was like essaying a minefield: it is really most unpleasant and the city needs to address it. The question is: “Will we return?” and I think the answer is “Yes”, but when it’s warmer, when it’s open, with our car on the ferry for an extended round trip. We loved it, despite our criticisms. Anyone who has read the scholarly works of the late Conor Cruise O’Brien, ‘States of Ireland’ and ‘Ancestral Voices’, will know he was not an ultra nationalist, to put it mildly. However, I was surprised when walking with him on Howth Head some years ago when he made it clear he did not share my enthusiasm for the EU project as it would lead to the rise of nationalism. I expressed my belief that as subsidiarity was central to EU policy that that would prevent that happening. Conor gave me a look of disbelief and said “it’s clear you have embraced that myth, just watch out as the years unfold”. In recent years we have seen the rise of nationalism in Europe yet again, with all the dangers it brings as history has taught us. Many politicians and commentators in the UK refer to it as a nation which it is not. It’s an amalgam of three nations – England, Scotland and Wales and part of Ireland. I beg to differ with Health Minister Simon Harris’s introduction of abortion services as a “momentous day”. The grave injustices yet to be inflicted on unborn babies can hardly be described in such a fashion. Abortion cannot be classified as healthcare. Why? Because it simply isn’t, despite the many valiant attempts to disguise it as such. For the 733,632 people who voted last May to protect the unborn baby, January 1 was calamitous. Congratulations to Bishop Kevin Doran for once again making it very clear that those politicians who actively promoted abortion are out of communion with the Church. It is time for all clergy and parish councils to take greater leadership in this issue, especially where several of these politicians cause such scandal and confusion in parishes by demanding church positions such as ministers of the Eucharist, ministers of the word and god-parents. Persuading British Prime Minister Theresa May that preventing EU citizens coming to the UK is morally wrong and economically self-harming is better than getting hysterical about the Troubles returning. Because we will still be free to emigrate to the UK is no reason not to fight for the same right for all EU citizens. A majority in the North voted Remain and if we fail to use the Treaties and EU law to defend and protect their wishes it will seem we have ulterior motives for not doing what is best for them, ie that we want to cause them harm. We’ll be unprincipled hypocrites if we accept what the UK demands.